When Sara and Jamie discovered the seemingly ordinary artifacts, they sensed the pull of a dim and distant place. A world of mists and forests, of ancient magics, mythical beings, ageless bards...and restless evil. Now, with their friends and enemies alike--Blue, the biker; Keiran, the folk musician; the Inspector from the RCMP; and the mysterious Tom Hengyr--Sara and Jamie are drawn into this enchanted land through the portals of Tamson House, that sprawling downtown edifice that straddles two worlds. 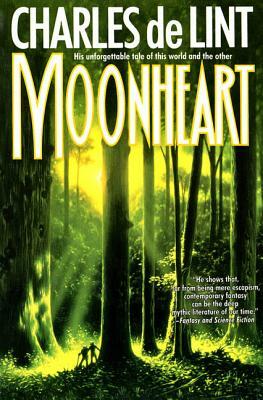 Sweeping from ancient Wales to the streets of Ottawa today, Moonheart will entrance you with its tale of this world and the other one at the very edge of sight...and the unforgettable people caught up in the affairs of both. A tale of music, and motorcycles, and fey folk beyond the shadows of the moon. A tale of true magic; the tale of Moonheart.